Preparation for the Fayette County Fair continued on Friday morning with volunteers and employees of all ages and from many different businesses visiting the Fayette County fairgrounds to help. Bryson Sheets helps clean swine stalls with a power washer with several other volunteers. With set-up for the 139th-annual Fayette County Fair finishing this weekend, the whole community is invited to the opening ceremony on Sunday. Following the Queen’s Tea on June 27, a field of seven ladies attempting to become the next Fayette County Fair Queen was narrowed to three. Those three — Victoria Schappacher, Haley Copas and Jordan Bernard — will be the 2018 Fayette County Fair Court and one will be named queen. The Fayette County Fair Queen will be crowned during the opening ceremony on Sunday at 2:30 p.m. at the McDonald’s Grandstand. Organizers are encouraging the entire community to join for the celebration. This year the fair will be held July 16-21. Currently, forecasts on weather.com predict the majority of the week to have cloudy skies and possible thunderstorms. Monday will begin the fair week with thunderstorms, a high of 86 degrees and a low of 70 degrees. Chance of precipitation is 90 percent. On Tuesday, scattered thunderstorms are expected in the afternoon with a high of 83 and a low of 62. Chance of precipitation is 60 percent. On Wednesday, sunny skies will bring a high temperature of 80 degrees and a low of 58 with no precipitation currently expected. On Thursday, partly cloudy skies with a high temperature of 87 and a low of 71 is currently expected. Chance for precipitation is 10 percent. On Friday, scattered thunderstorms are predicted with a 60 percent chance of precipitation. The high temperature is expected to be around 80 and the low around 61. Finally, on Saturday more storms could be expected in the evening with a 40 percent chance of precipitation. Temperature highs will be around 80 degrees and the low could drop to 62 degrees. Stay with the Record-Herald for coverage all week long from the 139th-annual Fayette County Fair, including the Fayette County Fair Queen announcement on our website Sunday evening. https://www.recordherald.com/wp-content/uploads/sites/27/2018/07/web1_IMG_3482.jpgPreparation for the Fayette County Fair continued on Friday morning with volunteers and employees of all ages and from many different businesses visiting the Fayette County fairgrounds to help. 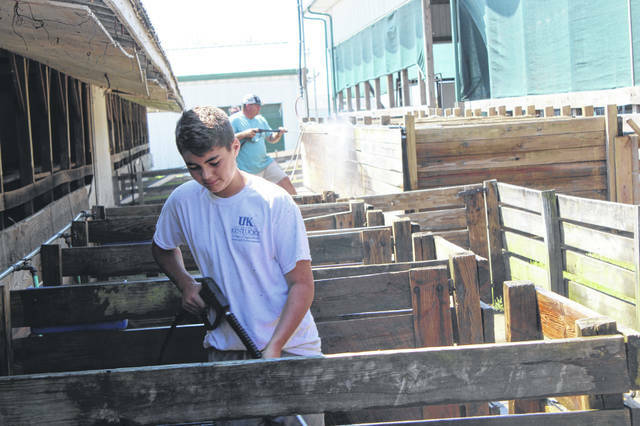 Bryson Sheets helps clean swine stalls with a power washer with several other volunteers.